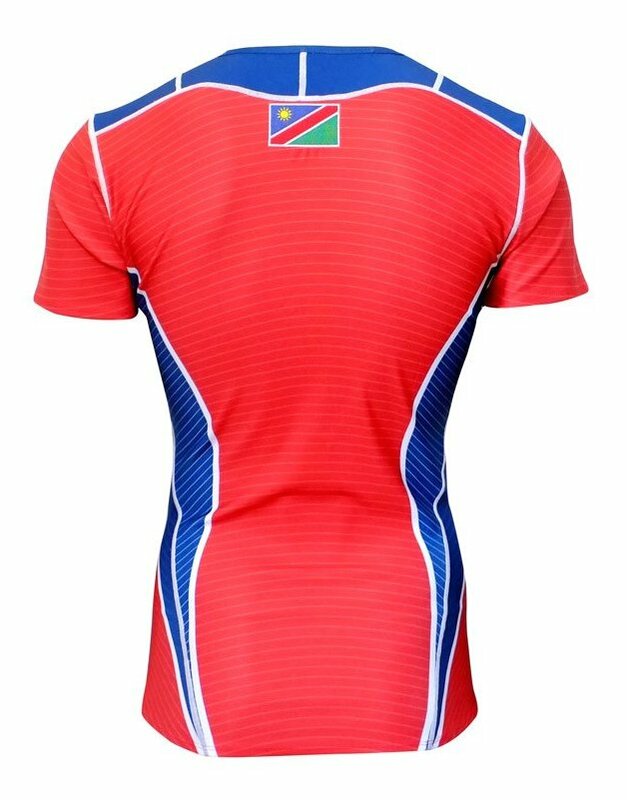 Last week we checked out the new Namibia home shirt from Canterbury, and while we quite liked the design, things weren’t entirely as they seemed. Now it’s time to check out the change shirt, and surely it can’t be that complicated again, can it? It’s instantly apparent that this shirt is the same template as the home, but with some mixing up of the colours. First things first though, it’s pretty refreshing to see an alternate shirt that isn’t either black or white! They’ve been few and far between in this tournament so far, and the red is definitely a nice change. If anything, we have to say that the colours here work even better than on the home shirt – we think the blue around the Loop neckline and the side vents works together really well, and it feels a bit less dated than the home shirt, though the mix of blue and red can’t help but remind us of the old IRB ref’s shirts. Yup, just like the home shirt, the ‘replica’ shirt that’s being sold is a completely different design, with no pinstripes, different side vents, and no 360° Loop neckline… hell even the badge is different! Yup, instead of the rather cool African fish eagle badge that the full team has, the supporters jersey has an alternative badge that sports the majestic shape of the Welwitschia, a plant native to Namibia and Angola. An interesting plant for sure, but, well… it looks like a pile of dirty laundry. 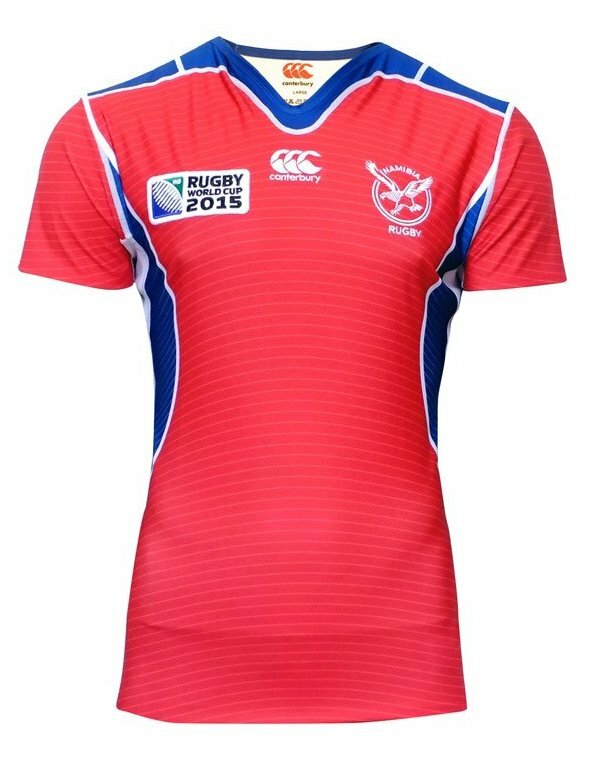 There’s a reason behind this of course – only players who represent Namibia are allowed to wear the eagle across all their sports (thanks to Chantel in the comments for clearing that up), in a similar way that only actual Springboks have jerseys with the word ‘Springbok‘ on them – the replicas have ‘SA Rugby‘. This isn’t new – it was the same with 2011’s Puma replica shirts which had a the different badge to the on-field design – but this goes further than the badge. The entire jersey is different, and it must be said, looks a lot more like an off-the-peg teamwear shirt as opposed to the bespoke design of the pro’s top. This isn’t Canterbury’s doing – the firm has produced faithful replica shirts for all their other teams in the tournament, so why wouldn’t they here? 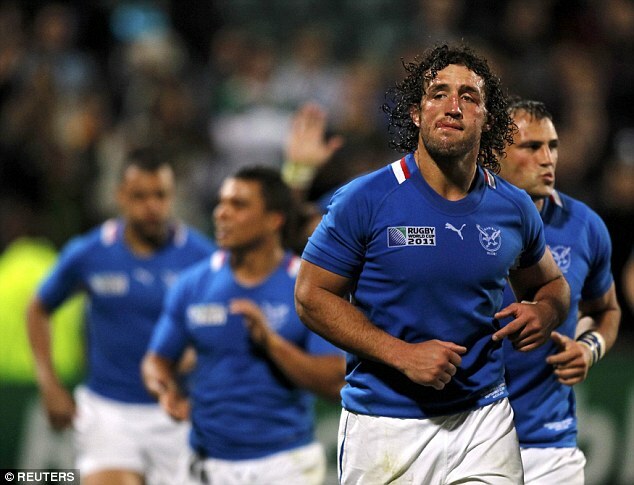 It has to have been a decision made by the Namibian Rugby Union, probably to save money. We understand money’s tight in a small union, but we still think trying to fob their fans off with a totally different shirt to the real thing is a bit of a poor effort. It’s a shame, because again, this is a really nice, interesting and original design from Canterbury – it’s just a shame their supporters won’t be able to show it. The Namibian Fish eagle badge is only reserved for National Players. So if you haven’t earned your National Colours you can’t wear it. That’s not a Rugby decision but is for all sports in Namibia. That’s good to clear up – but still doesn’t explain why the rest of the shirt is totally different!